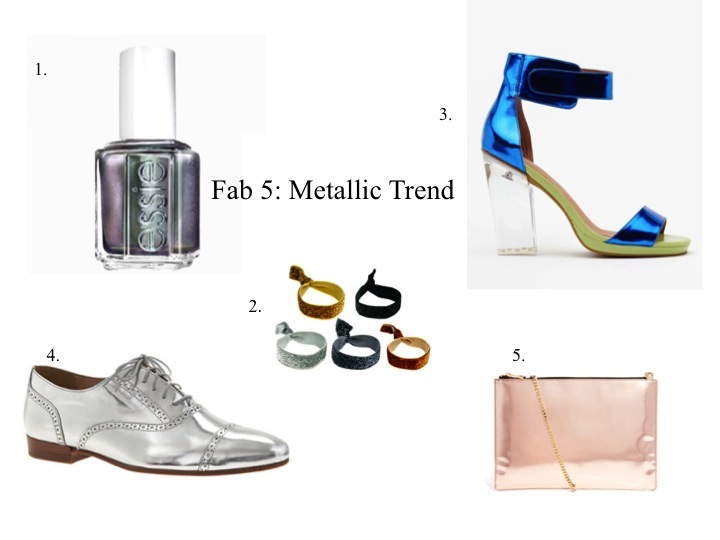 The metallic trend is pretty major this Fall when it comes to accessories and I can't get enough. Don't be afraid to make a statement with these fun additions to your outfit. 1. Just "for the twill of it" try this new metallic Essie nail polish color this fall. I'm going to be sporting it at NYFW. 2. Draw some attention to your awesome pony tail with these metallic hair ties from ASOS. 3. Make a statement with these amazing metallic heels from Nasty Gal this fall. 4. Oxfords + metallic = going on my J.Crew wish list. 5. Pair this metallic leather cross-body bag from ASOS with a LBD for a night out on the town. Love this trend!! I think those shoes are so fun-- I would be scared to rock them but they are soooo cute and fun! !